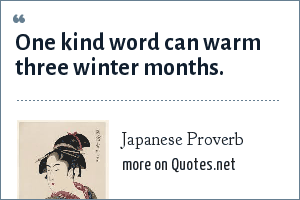 Japanese Proverb: One kind word can warm three winter months. "Japanese Proverb Quotes." Quotes.net. STANDS4 LLC, 2019. Web. 24 Apr. 2019. <https://www.quotes.net/quote/8024>.